I have joined a new monthly blog challenge. Yes, another one! This brings me to four. They are just so much fun. I hated homework in school, but when it comes to food blogging, having "assignments" really makes things interesting. This new (to me) challenge is a lot fun and I think you will really enjoy it. It's called "Eating the Alphabet" and it's hosted by Brenda at Meal Planning Magic. Each month the participants are assigned two letters of the alphabet and are challenged to make and post a new recipe using a fruit, vegetable, grain, bean, or legume that starts with one of the assigned letters. The whole point is to encourage the eating of healthy foods. Considering how many recipes I have on my blog, not very many of them are vegetable recipes, so I thought this would be a good way to branch out and increase my vegetable repertoire. I missed the first two months, so this month the assigned letters are E or F. What a month to begin! There aren't too many options with those letters. Brenda really encourages choosing foods that are in season, and trying food that are out of your comfort zone. I found out that fava beans are in season in the spring, and since I had never cooked with them before, I thought they would be the perfect choice. I called around to a few area grocery stores and none of them had fava beans in stock, but one, Meijer, offered to order them for me. Great! Meijer really does have a superb produce section with great variety. When I went to pick them up, I was informed that they tried to order them, but they weren't available. :( Bummer! Then I got to thinking that edamame is similar to fava beans and those are available year-round in the freezer section. I have cooked with edamame before, but it's been a while. So I switched gears a little bit and got into an edamame state of mind. I found a recipe for an edamame dip with goat cheese. I had tried an edamame dip a few years ago and failed, so I was kind of eager to try it again. And I had never cooked with goat cheese before, so that was interesting to me. This dip recipe originally comes from Food and Wine magazine. I changed it a bit; here's my version. In a large pot of boiling salted water, boil the edamame until very tender, about 15 minutes. Drain well and transfer to a food processor. Add the goat cheese, sour cream, lemon juice, garlic, and salt and puree until smooth, scraping down the sides of the bowl. Stir in the dill and transfer the dip to a serving bowl. Cover with plastic wrap and refrigerate for at least 1 hour or overnight. Serve the dip chilled or at room temperature with the pita chips. It turned out really well. The original recipe said to boil the edamame for 8 minutes, but the problem I had the last time I tried an edamame dip was that it didn't get soft enough and instead of forming a puree, it just got chopped up into little pieces. So this time I really boiled the heck out of it! I put 15 minutes in the recipe, but I probably did mine longer than that; I forgot to time it. I boiled it until it mashed well with a fork. The original recipe also called for chipotles in adobo, but that didn't sound like it went well with the other ingredients, and I didn't really want a spicy dip, so I left that out. I also decreased the sour cream and cut back on the lemon just a tad. Oh, and the recipe called for 2 tsp of salt. That's a lot! I started with just one, and it was a teeny bit on the salty side, so next time I will only do ¾ tsp. The recipe also called for spiced pepitas to go on top, but I couldn't find pepitas so I just left them off. I don't have a full-sized food processor, just a little 3 cup one, so my method was a little bit different. I pureed the edamame by itself in batches, then combined it with all of the other ingredients in a bowl. I had trouble pureeing the edamame by itself; it's a little dry for that, so I added a little bit of water to each batch. That probably made the finished dip a little looser than it was meant to be, but that's why I cut back on the sour cream. So in the end it probably evened out. I really like this dip. 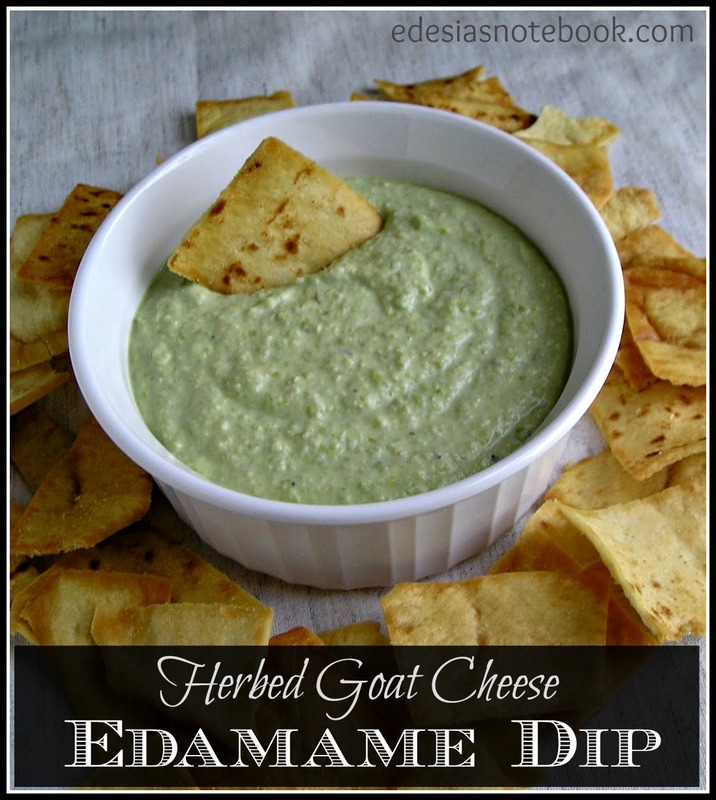 The herbed goat cheese flavor is really good combined with the vegetal flavor of the edamame. And it's really quite filling! I had some with my lunch and ended up really not having any desire to eat when dinnertime came around. I had it at room temperature and then later tried it cold and I liked it both ways. I ate it with pita chips, but it would be good on crackers, or even with veggie sticks as a crudité. This recipe makes a lot, I totally should have halved it. Anybody want to come help me eat it? Oh my! We love goat cheese at my house, so this would be a big hit here! 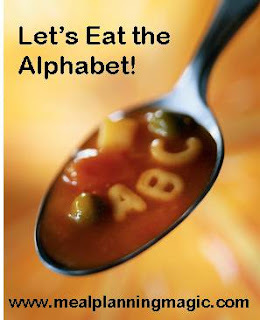 Welcome to Eating the Alphabet, it's a lot of fun! I'm still not a huge goat cheese fan--but this looks really really good! My husband liked it more than I originally thought he did, so he's really helping me put it away! Thanks for stopping by! The goat cheese flavor is pretty subtle, so you might like it.